When an English speaker doesn't understand a word one says, it's "Greek to me". When a Hebrew speaker encounters this difficulty, it "sounds like Chinese". I've been told the Korean equivalent is "sounds like Hebrew". 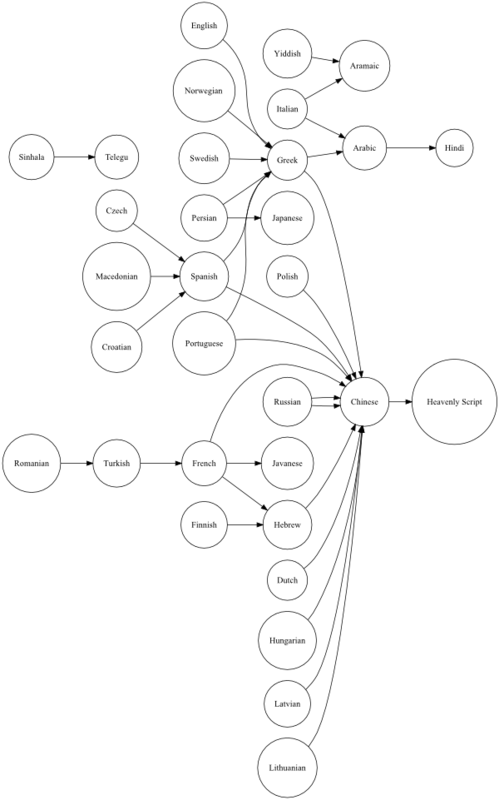 Has there been a study of this phrase phenomenon, relating different languages on some kind of Directed Graph? Well, there's a Wikipedia article on the topic "Greek to me" with a table of correspondences, a page at Omniglot "It's all Greek to me" with a similar table, and a forum thread at wordreference.com. Michael Quinion has a Q&A on the origins of the English expression, which includes the suggestion that the Spanish-American word gringo comes from the expression “hablar en griego”. But I couldn't find any serious scholarly study of this interesting topic. The "larger version" of the graph is still unreadably small. 2) if the result is too small, the mouse pointer should be in the form of a magnifying glass with a "+" in the lens — click it. I thought I'd heard Spanish used that way in Russian, but these sources seem to agree that Chinese is the language of Russian incomprehensibility. Am I just making that up? It's fascinating that when the Chinese find something unintelligible, they assume it is a product of Heaven while everyone else (according to the graph) assumes that it is another human language they can't understand. 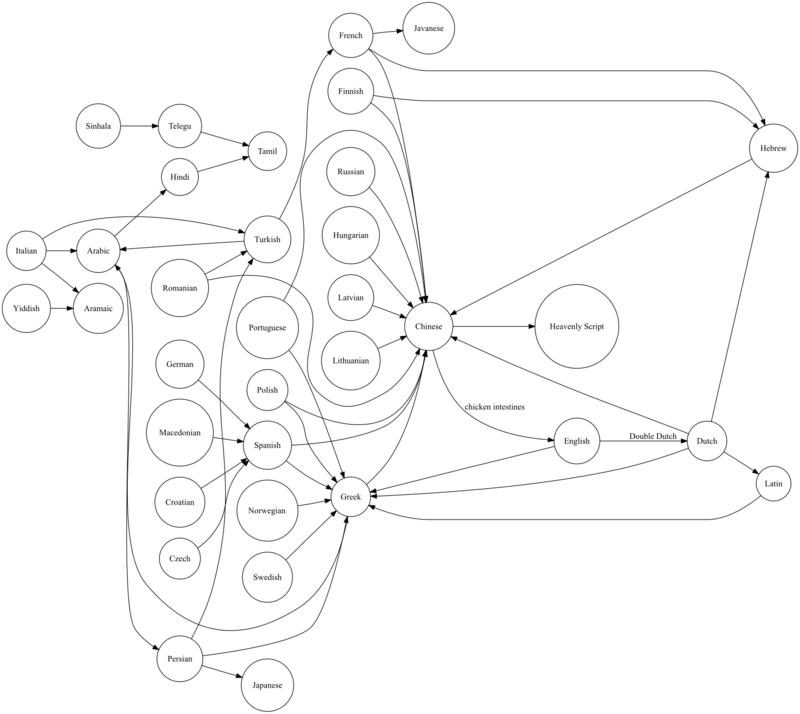 One interesting feature of the graph is that it is acyclic. Therefore there's a partial ordering of incomprehensibility for languages. I was taught in college that the equivalent German idiom was "Das is mir Böhmischer Dörfer" i.e, 'That's Bohemian villages to me', an apparent reference to the fabled (at least to German speakers) unpronounceability of Czech proper names. Hey, whatever happened to Double Dutch? Paul Clapham: One interesting feature of the graph is that it is acyclic. Therefore there's a partial ordering of incomprehensibility for languages. Indeed. But I suspect that this may be a sampling artifact — as more nodes and edges are added, I wouldn't be surprised to see some cyclic connections. Note for example that the Cantonese row in the Wikipedia table gives "'Chicken Intestines', referring to English". This would yield the cycle English -> Greek -> Chinese -> English, at least if Cantonese counts as an instance of Chinese, and chicken intestines counts as an instance of English. This brings up the important point, made in the Wikipedia entry, that most of these expressions are pretty clearly connected to differences in writing systems as much as differences in spoken languages. Graph is too small for me as well on FF3/Mac. There is no zoom option. Maybe drop the full size one into http://drop.io ? We need to get Colbert in on this. "Turkish is Romanian's Greek." It's not exactly a serious scholarly study, but it's a study by a scholar nonethless: The Hardest Natural Languages by Arnold Rosenberg. In the late 70s or early 80s I got a copy of a technical report from IBM Research on the topic. It was written in the form of a serious scholarly study, but for fun, of course. I think the methodology was to draw on the diverse linguistic backgrounds of researchers at T. J. Watson to compile a long list of idioms. The paper concluded, I think, that Chinese was the world's most difficult language. I think I still have this paper somewhere in my files and will follow up if I find it. Tim: I think you're referring to the paper I linked above. The German equivalent is "Das kommt mir spanisch vor." I've never heard of "böhmische Dörfer", although that may be regional. Of course, the English-language use of "it's Greek to me" comes originally from Shakespeare's Julius Caesar, where it is spoken by a character whose English presumably represents Latin, about a speech that was actually said to be in Greek. From two different sources I've heard in German "Mesopotamisch!" One reason for at least the Swedish use of Greek may be that long ago, in Latin classes, any Greek in the classics was skipped, accompanied by a phrase in Latin that meant, I think, "That's Greek, it isn't read by us". Yeah, my high-school German teacher taught us the German idiom equating Spanish to something incomprehensible to them. Well, I looked for about three minutes and then thought, "This is too hard, maybe I should start by asking The Google". Bingo. Arnold Rosenberg, The Hardest Natural Languages, Lingvisticae Investigationes, III:2, pp. 323-339, 1979.
which is available in the form of a scanned in copy from his web site at UMASS. My Polish mother occasionally describes gibberish as being "like a Turkish sermon". The Hindi equivalent would be Farsi, since it was regarded as a language of the learned and unintelligible to the masses. So the graph does seem to be cyclical, in part. German "Das kommt mir spanisch vor" does not express befuddlement at the incomprehensibility of an uttering, but suspicion. An English near-equivalent would be "I think there's something fishy going on here". Where an English speaker would say "it's Greek to me", in German you'd probably have "Ich verstehe nur Bahnhof" (lit. "I only understand 'railway station'"). Of course, that only reflects my idiolect. YMMV. In Slovak, it's Hotentot or, in some parts of the country, Hungarian. Spanish is used as well, but it's rare. The term "Spanish village" is used of incomprehensible texts or subjects one is not familiar with, e.g. "Matematika je pre mňa španielska dedina" (Math is for me a Spanish village) = I'm very bad at math. Dictionary of International Slurs (Ethnophaulisms : With a Supplementary Essay on Aspects of Ethnic Prejudice) by Abraham Aaron Roback, 1944, 1970, 1979. "Ich verstehe nur Bahnhof" is something I only learned because it's in the textbook we use to teach German. I've never actually heard a German use it and at least one of my (native German speaking) colleagues hadn't heard of it, either. I've read that the use of 'spanisch' dates back to a time when Spanish fashion and the Spanish language was popular at some German court. On another note, the saying in Esperanto is something like "Tio estas volapukaĵo" – that's Volapük. Again, I've never actually heard it used in a conversation. The Irish word for "jargon" is "béarlagais"… and "Béarla" is the Irish word for "English" (language). When I looked into this ten or fifteen years ago, I also found the arcs Danish->Hebrew and Italian->Turkish. The latter was illustrated by someone saying that his mother used to say to him: "Parlo italiano o turco ottomano?" German "Das kommt mir spanisch vor" does not express befuddlement at the incomprehensibility of an uttering, but suspicion. …I've often seen written, but never heard said, so the default assumption is "they say it somewhere in Germany". "Béarla" is the Irish word for "English" (language). Though before that, it was the term for the refined (so perhaps archaic) language of poetry. David Marjanović: Do the two arrows from Russian to Chinese mean spoken and written? No, they mean that I got careless and entered two Russian -> Chinese lines in the DOT file that I transcribed from the tables at Wikipedia and Omniglot. "In Slovak, it's Hotentot or, in some parts of the country, Hungarian. Spanish is used as well, but it's rare. The term "Spanish village" is used of incomprehensible texts or subjects one is not familiar with, e.g. "Matematika je pre mňa španielska dedina" (Math is for me a Spanish village) = I'm very bad at math." We use the same thing in Serbian – španska sela. It's all INTERCAL to me. There seems to be some clearly observable development over time here. From the comments here and the linked references, it looks like Spanish used to be a lot more incomprehensible than it is now – to some extent in Slovak and certainly in German, where it seems to have given way to Bohemian villages and the (generally tongue-in-cheek) "verstehe nur Bahnhof". I wonder if we can expect Chinese to go the same way? I might also mention that I have heard people in Germany say "ich verstehe nur Bahnhof", although it's usually used in a joking way. And at least once I've heard a German native speaker say – in English – "I only understand train station". That was perhaps when I first fully understood just how delightful that German expression is. @chris: I doubt it's that Spanish has gotten harder, certainly no native speaker of these other languages would ever have understood Spanish. More likely, the early lead of Spain in navigation meant that speakers of other languages were more likely to interact with nonsense-speaking Spanish traders than with speakers of any other language. "Béarla" was 'language', and 'English' was "Sacs-Bhéarla" , as used in the Irish-language text of the 1937 Constitution Articles 4, 8, and 25. Béarlachas is not jargon but rather Irish which is (purportedly) polluted with too many Anglicisms. The term is a bit like "Franglais", "Spanglish", etc. No one seems to have mentioned "Double-Dutch" yet, is that a purely British expression? Referring mainly to spoken language, e.g. technical jargon etc. "What did he say?" "Dunno, it sounded like Double-Dutch to me". I suppose the point here is that Dutch is not that far from English, but just too far away to be comprehensible. I'm fairly sure btw that the Irish word "Be:arla" originally just meant language and needed to be qualified. (< be:al-re where be:al = "mouth"). In spite of what Yuval Pinter has been told, I've never heard a Korean expression meaning "sounds like Hebrew", and I'm a native speaker of Korean. In fact, I cannot think of any standard expression in Korean that corresponds to the examples discussed. The Korean version of the Greek to me Wikipedia page lists no example for Korean itself. I've tried searching the idiomatic phrases section of some Korean dictionaries, but I haven't found anything. So I highly doubt Korean uses such an expression. At least French speakers say "c'est de l'hébreu". I wonder if things ever "sound like Korean" to anyone else. I'm fairly sure btw that the Irish word "Be:arla" originally just meant language and needed to be qualified. I noticed that you have nothing for Japanese. I think the closest equivalent would be "chinpun kanpun" (珍紛漢紛・珍糞漢糞) or "chinpunkan" (珍紛漢・珍糞漢・陳紛漢・陳奮翰), which (according to the Kojien) likely originated from an attempt to mimic the Chinese terms used by Confucian scholars in Japan (and later was used to mimic the foreign languages of the various individuals who showed up from "the West.") I suppose one could draw the arrow from Japanese to Chinese, then. Hostile reviews of the Ravel String Quartet likened it to "Chinese music," and Cab Calloway fired Dizzy Gillespie for disobeying an order not to "play that Chinese music in my band." I've come across (but can't cite) other instances where "Chinese" is used disparagingly of music the listener finds unpleasingly dissonant or formally unfamiliar. I doubt Korean is heard enough in most parts of the world to have earned a stereotypical 'sound'. Certainly I could not distinguish it from any other East Asian language without significant prior study. I wouldn't be surprised if people living on the (U.S.) West Coast had more of a stereotype of Korean, since they would have been exposed to it far more than I have. In Taiwan, 火星語 (Martian) is the preferred term for both incomprehensible language (It's Martian to me!) and internet slang or abbreviations that older generations don't understand. The late great Don Harlow taught us Estas Volapuk al mi!, as I recall. Volapük was created shortly after Zamenhof created La Lingvo Internacia. From all accounts, even Schleyer wasn't able to actually speak his language, making it even more difficult than Marc Okrand's intentionally-hellish Klingon. In Austria, it's Spain that's the target. The aforementioned train station (Bahnhof) is also used. Finnish speakers also use the word siansaksa for incomprehensible gibberish, somewhat in parallel with the English phrase Double Dutch. It literally translates as "pig's German." The German Wikipedia lists Kauderwelsch, which seems to have a similar meaning as well. In Icelandic we say "Þetta er latína fyrir mér" or "this is Latin to me". You can also say, more generally about strange looking things "Þetta kemur mér spánskt fyrir sjónir" or "this looks Spanish to me" (lit. "This comes me Spanish before sight"). What about West Africa and "Mumbo Jumbo" ? "Volapük was created shortly after Zamenhof created La Lingvo Internacia. From all accounts, even Schleyer wasn't able to actually speak his language, making it even more difficult than Marc Okrand's intentionally-hellish Klingon." Schleyer created Volapük in 1879-1880, and Zamenhof first published Esperanto in 1887. Zamenhof used Volapük as an example of what *not* to do in making a language. There's really no expression in Slovenian in current idiomatic usage that would fit the bill. To mi je španska vas ('this is a Spanish village to me') is used, as apparently also in other West and South Slavic languages, for any incomprehensible subject. What's notable is that certain middle-class speakers, including myself, have recently (?) started using pueblo español instead. An non-analyzable mixture of pretentiousness and sarcasm, I would say. German also offers "Fachchinesisch" (roughly: technical jargon). Not in the part where I come from. Apparently the last part of that name [Kauderwelsch] does not necessarily have anything to do with Welsh. Etymologically, it does — it's just that that means Romance rather than Celtic on this side of the Channel. The rest of the word is the city of Chur in Switzerland, close to which Rhaetoromance is spoken. Zamenhof used Volapük as an example of what *not* to do in making a language. Just to give you a frame of reference, today people use Esperanto as an example of what not to do in making an international auxiliary language! Volapük wasn't even meant to be easy. It was meant to be logical. Doesn't seem to have worked either. I think there's a confusing conflation going on here. As a native (British) English speaker, the term "it's all Greek to me" would refer to any concept I didn't understand well (like, say, maths or computer programming) whereas the term "double Dutch" would refer specifically to a language I couldn't understand. Also, I've never heard the terms "That's Bohemian villages to me" or "I only understand train station" but I have been in Bohemia and I can tell you that everyone travels by train and the trains go to every little village. So the experience of standing on a station platform, hearing announcements, is that you hear a long stream of gibberish (being the names of destination villages) frequently punctuated by the word for "station", which you quickly learn to recognise. So I can imagine that both expressions refer to this experience, the latter perhaps once having been a response to the former by way of assent. I've seen instances, in the IT field, of "Polish" and "Hungarian" used as the "unintelligible" languages, usually preceding the word "notation.". Another German here. I've heard all the examples mentioned for German so far, although to me "das kommt mir spanisch vor" is an expression of mistrust rather than incomprehension. I can't think of any more as far as this goes. Other not entirely relevant but, I suppose, connected expressions include the verb "türken" for forgeries and frauds (one common suggestion for the etymology is the well-known chess "automaton"), which I think has been declining somewhat presumably due to not being entirely polite, and "Jägerlatein"/"Anglerlatein", which mean "hunter's [or angler's] Latin" and refer to the tendency of the stereotypical sport hunter or fisher to exaggerate their successes, or generally "-latein" appended to some group to refer to their jargon, though I can't say I've actually heard this used in spoken language. One imagines a python programmer looking at some inscrutable code, saying "looks perl to me ..", or a perl programmer saying "… OMG, who wrote this mess of APL?" But what can the poor APL-er say? 1. Volapuk is indeed used by Esperantists as the archetypal 'what-not-to-speak'. I've indeed heard the word 'volapukjho' for 'mangled words'. And notice that 'volapukistoj' has been added to the list of Haddockian abuse. 2. > "That's Greek, it isn't read by us" is indeed a notice inviting to skip part of a text : 'Graecus est, non legitur'. The Esperanto expression I've usually heard uses "Volapukaĵo", note the -aĵo suffix indicating something Volapükian, not necessarily Volapük itself. On a related note, I wonder if there are other languages that use an expression similar to the English "Pardon my French", used when swearing. I've never heard anything about this, although I would imagine it exists. I've just looked, for mere curiosity, at that anti-esperantic site. There are so many errors, about intents, structure, phonemic content, vocabulary … that I think it is based on guts, not collected information. Especially, the case is based on original Esperanto, completely forgetting that this language evolves as any other does. As a result, many liabilites that are mentioned look like critics made on English using data from Old Saxon. I was taught that the ancient Greeks considered foreigners to sound like sheep – "bar-bar-bar", which led to the word barbarian. And in response to William F Dowling re: APL; as Rubrick mentioned, there's always INTERCAL or Befunge. > El Said : 'volapukajho' means 'a sentence or utterance in Volapuk'. But contempt for Volapuk goes a bit farther. I really love that analysis. Even if it turns out to be indefensible, it is so elegant and intuitively understandable. Vaguely related??? Is the use of other cultures to refer to confusion or confusing or irrational situations. Polish uses the term Czeski film (Czech movie) for a situation that makes no sense (as encountered in bureaucracy). German has Polnische Wirtschaft (Polish economy) referring to a chaotic situation. I've been reflecting on Yuval Pinter's original question, and Prof. Liberman's approach to a response, and I'm not comfortable with the direction of the analysis. Although SOME of the languages used in slurs are objectively difficult to learn or comprehend, others might be relatively easy to learn, especially by speakers of related languages. Nevertheless, some of those latter people use the object language in an ethnic slur that, IMHO, demonstrates more about the attitudes of the latter toward the object people/culture than toward the language. If our methodology can't separate language difficulty from attitudes toward a particular set of foreigners, then this discussion is about interesting anecdotes. This discussion immediately brought to mind Tom Wait's "harder than Chinese algebra" — though of course, he wasn't talking about a difficult language. On the other hand, maybe that's where it got its name. Assuming béarlagais is a typo for béarlagair, this is indeed the common word for jargon and may well be perceived nowadays as being derived from the word meaning English since the original sense of béarla meaning speech is more or less obsolete (except in the word béarlagair itself). Hmm, the Forth computer language uses *Reverse* Polish notation, there's even a version with all the commands in Klingon. If conventional algebraic notation is SVO, then Polish Notation is VSO and Reverse Polish SOV, well near enough. Not sure how the Poles became involved though. Reverse Polish Notation is derived from Polish Notation which was created by a Polish mathematician (that much I remembered). And (thanks Wikipedia) the mathematician was Jan Łukasiewicz. "Rede ich denn Chinesisch?" (Do I speak Chinese?) as a rethorical question asked when feeling ingored, suggesting the reason of not beijing :-) understood, or the term "Fachchinesisch" as the special language (Chinese) of a field ("Fach") (e.g. good command of techno speak). Yeah, I can confirm "das kommt mir Spanisch vor" as "that seems fishy"; "ich versteh nur Bahnhof" is the stereotypical expression for expressing lack of understanding, but it's nigh unused in Austria. Not quite the same, but: "Chinese" also appears in some English phrases as a synonym for incomprehensibility, as in the children's game of "Chinese Whispers"(where a rumor is repeated and distorted) and the "Chinese fire drill"(a complicated and meaningless procedure in which onlookers are tricked into participating). apropos of the discussion in general, i felt i should remind of audience of Perligata, a translation of perl into latin–not just of keywords, but incorporating conjugation and declension to indicate data type. Further on Polish: Bob's mother knows her Polish perfectly well, traditionally the expression was "to sit (and listen) as if at a Turkish sermon", it seems not to be in active use of younger people now ; the Wikipedia expression does not sound idiomatic: the noun "chińszczyzna" is used above all about regional cuisine (Chinese food), "jak chiński" (like Chinese) would be more like it. And "czeski film" (Czech movie) is used with reference to nonsensical situations, not to the language. No doubt with reference to absurd humour of some Czech comedies. Interesting comments about Esperanto! It's unfortunate however that most people are still unaware that Esperanto has become a living language. Esperanto is in the top 100 languages, out of 6,800 worldwide, according to the CIA factbook. It is the 17th most used language in Wikipedia, and in use by Skype, Firefox and Facebook. Native Esperanto speakers,(people who have used the language from birth), include George Soros,World Chess Champion Susan Polger, Ulrich Brandenberg the new German Ambassador to NATO and Nobel Laureate Daniel Bovet. In both Dutch and German, Chur-Wälsch, a Romansh language (nl: 'koeterwaals'; de: 'Kauderwelsch') is used for gibberish too. Could the artificial language spammers please go sit at the kids' table so that the grown-ups can continue their discussion? Tnx. I've always assumed (without any real justification, I admit) that this is more connected to _East_ Africa. After all, "jambo" is Swahili for "business, matter for concern, something-or-other", and "mambo" is its plural. "Jambo! ", short for "Hujambo?" (= "You've got nothing concerning you (I hope)?" — "hu-" is the 2nd person singular negative present tense prefix), is, as most people here will know, the East African greeting equivalent to our "Hi! ", and is probably the most common Swahili word any foreigner there is likely to have addressed to them. Of course, the fact that "mambo" sounds like English "mumble" no doubt has something to do with the use of "speaking mumbo-jumbo" for speaking either nonsense, or an unknown language. In fact, the proposed Romanian equivalent is approximate. It means: "Are you Turkish? ", which we use to point out (rhetorically) to a partner in a conversation that he/she may be of inferior intelligence due to being unable to understand what we're saying. It also marks with great precision the moment when the speaker has lost patience. Hence it is not at all a way to acknowledge one's own inferiority, but to highlight another's. I am not aware of expressions of the kind "it's all Turkish to me." I can't really think of a true equivalent, at this time. Get it to the highest magnification you can and then copy and paste it into a Word document. the small German states pinched between the two Spanish-dominated areas. Rachel Fulton's suggestion that only Chinese considers the unintelligible a product of heaven is voided by English's "you're speaking in tongues". I am a Chinese (Mandarin and Shanghainese) speaker. I don't know the origin of these idioms, but isn't it much easier to just say: what are you talking about? I don't understand you? I am not sure where they get the idea that the Chinese think it's from the heavens when they hear something incomprehensible. Since China has so many regional dialects and many are incomprehensible to each other, I would guess most Chinese would ask the other person: which province are you from? What dialect are you speaking? And they'd find someone from the same province to serve as interpreter for that person. Nowadays though, almost all Chinese speak Mandarin (in addition to their own home dialect) so that they can communicate with each other. The written form of Chinese however, is the same. Since I grew up in the States, I am lucky to be bilingual. It's clear Chinese is much more difficult than English. Sometimes I feel sorry for people cannot speak, read and write Chinese. It's such a wonderful language (especially the picturesque writing). It's like you guys are missing out on a whole different set of sensations, a whole different world. In Chinese, a "heavenly script" only refers to written language. "ghost sign" and "tadpole script" are also used in the same way. An unintelligible spoken language is referred to as "bird language", "extraterrestrial speak", "ghost tongue", "foreign language", or simply Japanese. No, you're wrong. Chinese is the incomprehensible language of choice in Russian. Ted, your story about Japanese reminded me of a Norwegian phrase – well, an English phrase also: "Hocus pocus". Isn't really on topic, but it's also an example of an imitation of a foreign language (church latin, of course, from the phrase "Hoc est corpus…"), rendered meaningless. It would be interesting to see which phrases people use to mimic speaking other languages as well. Your Scandinavian language of choice, can of course be expressed by imitating the Swedish chef "Hurdy gurdy bork bork bork." I'm not aware of any such "expressions" in Norwegian – other than the derogatory rendering of Chinese as "Ching chong". Arabic speakers do NOT call incomprehensible things "Hindi" they say "It's chinese" or "it's sanskrit". The chart is wrong. I'm a native greek speaker, and I've never heard anyone use Arabic as an example. Chinese is indeed used, as well as "alabournezika", which has no obvious correspondence to a real language/country/people. Most of the online greek references claim the word originates from Livorno, Italy. In Pakistan, they use either French or Chinese as the ultimate non-understandable language. Being a Greek myself, when referring to something difficult to grasp in terms of linguistic understanding, we say: 'It's all Chinese to me' and not Arabic as noted. I'm from Spain, and I don't think I have heard “hablar en griego” (“to speak in Greek”) before. That said, its meaning would be clear to most Spanish-speakers. Instead, much more common is “está en chino” (“it's written in Chinese”). That expression is widely used for unintelligible written language. For spoken language, most Spanish people would use other expressions, not referring to any foreign language in particular (such as “habar en guiri”). It might be different in other Spanish-speaking countries, though. AS tripu said (being spanish myself too), i've never hear the "to speak in greek" thing. The most common is chinese, but we use it for anything we don't understand, mainly in the form "me suena a chino" (that sounds like chinese to me). Also when someone is giving excuses or speaking about something they were not asked about we say something like "no me cuentes un cuento chino" (don't tell me a chinese tale). Two of the oldest languages of the world are conspicuous by their absence in the flow chart..They are are Sanskrit and Tamil .Any existing language will find its roots going back to either or bith of them . Germans say "Es kommt mir spanisch vor" –> "it sounds like spanish"
I'm a native Spanish speaker. In Argentina we certainly use es chino para mi (it's Chinese to me) as the graphic shows. It is used when you come across something difficult to understand especially when reading. I've heard of another theory regarding the word "gringo". It is said that it was used for the first time in Mexico when de American army entered their neighbor's territory in the pursuit of Pancho Villa. The Americans where undesirable visitors so Mexicans just wanted the "greens to go back to their homeland" (as they wore green uniforms). "Gringo" meant "green go" and it was later used in the rest of Latin America when referring to Americans in a pejorative way. In Argentina it is still used for European visitors as well but as a term of endearment. Love the study! In Switzerland (German speaking, but may vary per dialect), we do use "Chinese" and "Kauderwelsch", which was referred to earlier. The Bahnhof (train station) is very common too; context also clarified above. Wouldn't it make more sense to put the graphs on a map? To discover that most languages refer to chinese as something they don't understand could have been easily made from a simple table too. As we're talking about languages, and relating one language to another in terms of not understanding, the german "Bahnhof" doesn't really make any sense, although it does say (nearly) the same thing. It's spanish what we're looking for. Correction for the Czech language, by a native Czech speaker: we use a saying "it is Spanish willage for me" when we do not comprehend some topic or system but this never applies to foreign languages. We universally use the word 'hatmatilka' (gobbledygook) for this. If someone (a Czech) does not understand what I talk about I may use "do I speak Hungarian?" if I get upset by this. "Volapük" (or rather, "volapyk") is apparently also used in Danish for any sort of incomprehensible language. Czech, in turn, calls any sort of incomprehensible specialist language "ptydepe" – which is not a real constructed language, but the fictitious constructed language in Václav Havel's play The Memorandum. As a native speaker of Russian I can say to you that Chinese is the example of incomprehensibility in Russian. When we don't understand what someone is saying, we say "Для меня это китайская грамота" ("For me it's like Chinese writing"). As noted earlier, the English phrase is used in Julius Caesar. Translations of that work could be mined as source-material for further investigation. I would like to use your graphic (built from A. Rosenberg's work) as base for an illustration for a conference on "identities ans alterities" in social psychology, organized by Lyon 2 university's institute of psychology. – Do you agree with this use of your work? – If yes, how do you want your name to appear as image source? a word about how it looks in the Polish language. As some other nationalities, we say "it's Chinese to me" ("To dla mnie chińszczyzna"). But also, we have an expression "to listen to a Turkish sermon" ("siedzieć jak na tureckim kazaniu"), meaning not to understand anything. In our history, mainly in the XVII century, we had a lot of contact – and wars – with the Turks, which explains the origins of this saying. Although the use of the word "sermon" is curious, as – if I remember correctly – there are no sermons in the islamic religion. Here in Brazil, besides "Greek to me" which is the most common, "Javanese to me" is also used to some extent. An interesting demonstration of this is a short and funny short novel of Lima Barreto called "O homem que sabia javanês" (The man who could speak Javanese) , where a man easily climbs the social ladder by claiming to be able and speak it, when he actually only read an encyclopedia article about it. I am not sure if the novel is an expression of the "Javanese to me" or the expression originates from it, though. I AM East God Words? WE ARE West God Words? "Although the use of the word 'sermon' is curious, as – if I remember correctly – there are no sermons in the islamic religion." Perhaps that is point – Gibberish is being compared to a supposed Muslim attempt to ape Christian forms. As a native Danish speaker, I agree with the mention of Volapyk as the standard nonsense language. Older speakers also use Kaudervælsk (Kauderwelsch), but it seems to be dying out. Similar to the "Spanish village", we will say of a subject that someone has little or no knowledge of is "en by i Rusland" (a town in Russia). The phrase "løgn og latin" (lie and Latin) is used for a downright and obvious lie. On a tangent, I've seen Volapük used as the name of a lake in a French comicbook, Le Monstre du Volapük. There's an additional aspect to the German expression "das kommt mir Spanisch vor". This doesn't only mean something is incomprehensible but also that something seems fishy. I have never, EVER heard of the expression "It sounds like Hebrew to me" used in Korean. "히브리어 같에" or "유태인어 같에" not only sounds awkward, academic and forced, it's simply NEVER used. Can you please provide source material to validate the claims that Koreans use that term? For gibberish, or when something sounds like gibberish to us we sometimes say "중얼 중얼" which is itself an onomatopoeia and refers to the mumbling, incoherent speech. It is fairly common to hear "뭐라고 중얼 중얼 거리니?" and if I were to take a wild guess, I'd say that 중얼 probably has its roots in "중언" (中言) or "중어" (中語), or simply the more modern form 중국어, meaning Chinese. Ergo, "뭐라고 중얼 중얼 거리는 거야?" should probably be taken to mean "Are you talking to me in Chinese?" or "Is that Chinese you're talking?" or "What are you, talking in Chinese?" The site linked, however, claims that the term "중얼거리다" comes from the habit of Buddhist monks "mumbling" their sutras and mantras, (which would have sounded incoherent to uneducated laymen). If this theory is true, it is possible that the term itself is a shortened form of "주술거리다", meaning "to recite an invocation". If you've ever sat in a Korean Buddhist temple, you might have some context. Korean Buddhists typically chant in Chinese (since Buddhism was introduced to us via China), and for the average Korean (me myself included) the full sutras read in Chinese sound like utter, mad gibberish. Again, the ultimate meaning might end up referring how Chinese as a language is unintelligible to Koreans. It has been mentioned many times that Spanish is (or was) one of most common examples of unintelligible language, together with Greek and Chinese. Greek commonly used in countries where Latin was used, the best example is. English and the Julius Caesar's play. Also remember that Latin was used in all Christian rites and even oficial documents. Spanish seems to be commonly used in countries influenced by the Spanish Empire, it will be interesting to research when it we first used and if the usage started when the influence of the Spaniards was high. The German expression cou,d originated from emperor Charles V of the Holy Roman Empire "forced" to learn Spanish due to his dual role as emperor of Spanish empire. Chinese seems very common in a wide range of nations which raises also the question of when it was first used as the global influence of China started just a few decades ago. Finally, it is fascinating how our understanding of our languages allows us to enrich our cultural understanding of other nations.